Designed by architect Decimus Burton (he of the Kew Palm House fame), the London Colosseum was a vast, 16-sided domed structure erected in the 1820s to the east of Regent’s Park to house a panoramic view of the city. Said to be the largest ever painting created at the time, Thomas Hornor – a land surveyor – oversaw the creation of the work which was based on drawings he had made from the top of St Paul’s Cathedral (he had apparently sat in a special, temporary hut or “crow’s nest” positioned where the cross and ball would normally sit – but it was in the process of being replaced). Several artists – led by the renowned ET Parris – were involved in creating the work which took four years to make before it was completed in 1829. 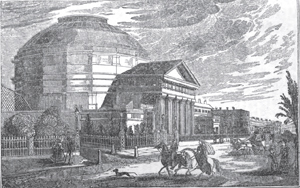 The building – located where Cambridge Gate now stands – had been modelled on the Pantheon in Rome (not the Colosseum as the name would suggest) and was constructed from brick rendered with cement to imitate the appearance of stone. It featured a portico with Doric columns at the front and had inside an “ascending room” or lift to take people to see the panorama. It’s opening was apparently delayed after Horner and his chief backer, MP Rowland Stevenson, took off to the US after running up rather large debts, leaving the property in the hands of trustees. The Colosseum changed hands several times over the years and its purpose evolved. At one stage it was reinvented as a museum of sculpture displaying some 180 works while other attractions added to the great rotunda and its surrounding gardens over the years included a “Gothic aviary”, a Swiss chalet from which a visitor could look at a real waterfall and a stalactite cavern as well as a theatre and various other panoramas depicting everywhere from Paris to Lisbon. Among visitors to the attraction were Queen Victoria and Prince Albert. The Colosseum was put up for auction in 1855 but failed to attract a bid of the size required and, having passed through several hands (with some of the owners at one stage flirting with the idea of turning it into a grand hotel), it was eventually was demolished in the 1870s.